At the end of the credits a blank screen appears but then a Hidden Menu screen appears. It has the teaser trailers for Ironman and Transformers as well as a montage of clips from the movie. On Disc 2, enter the "Their War" Menu. Set the icon to the RIGHT of the "Inside the AllSpark" option. Press LEFT on the remote and this will highlight a secret icon to the LEFT of "Main Menu." Select this icon, and you will see a clip about Michael Bay's cameo. 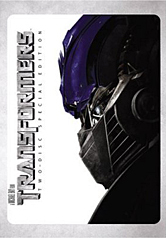 On Disc 2, enter the "More than Meets the Eye" Menu. The icon, by default, will be to the right of the "From Script to Sand" option. Press UP on the remote and this will highlight a secret icon to the left of "Main Menu". SELECT this icon and you will see "Casting Mojo. Insert the second disc of the set in your DVD player and on the Main Menu highlight the 'Settings' menu entry. Now press the 'Right' arrow key on your remote control and the mask of Optimus Prime will appear as an icon. Press 'enter' now and you will get to view the DVD credits. Now select 'Our World' from the Main Menu and on the following screen highlight the menu entry 'I Fight Giant Robots.' Now press the 'Down' arrow key on your remote control and an icon of Bumblebee�s face will appear. Press 'enter' now and you will get to see an amusing commercial for the 'Baybot,' a transformer that looks like director Michael Bay. Still in the 'More Than Meets The Eye' section, select the menu entry 'Trailers' and there highlight 'Trailer 4.' Press the 'Right' arrow key on your remote control to highlight the icon of Ironhide�s face and then press 'Enter.' This will give you the chance to view a clip about the special effects man enjoying his job that day, as they work on the Xbox-Transformer effects.